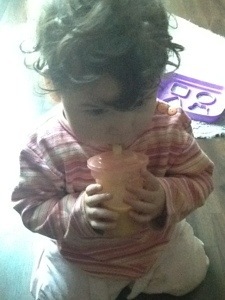 The only thing she was interested in was her sippy-cup of water, or plates and spoons. With any of these, she would occupy herself for hours. But with food? Well, she’d pick at it, but that was about it. I got the dust-ball out of her mouth, and she gave me a devious grin. I’m telling you, this girl KNOWS that she is being difficult! 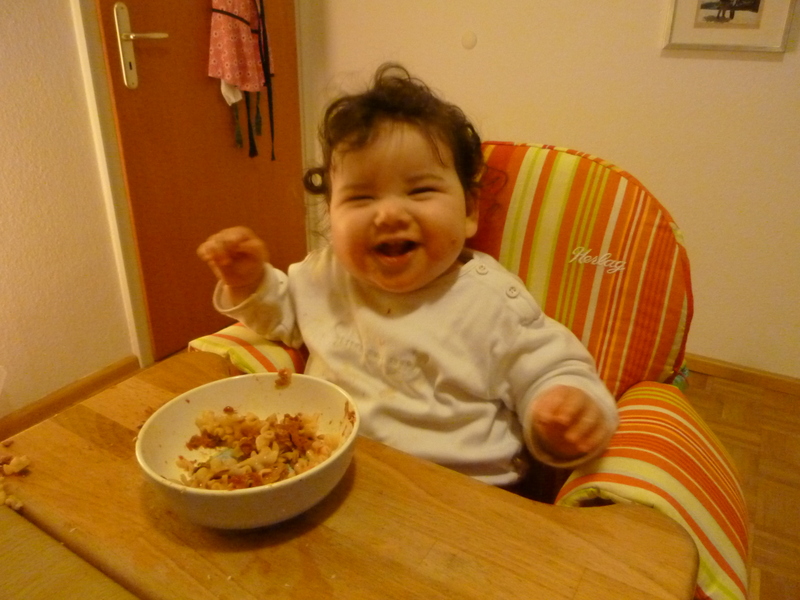 So then I went and got the food from her high chair, and put it on the floor in front of her. She took one look, turned away, and scooted off into the next room. 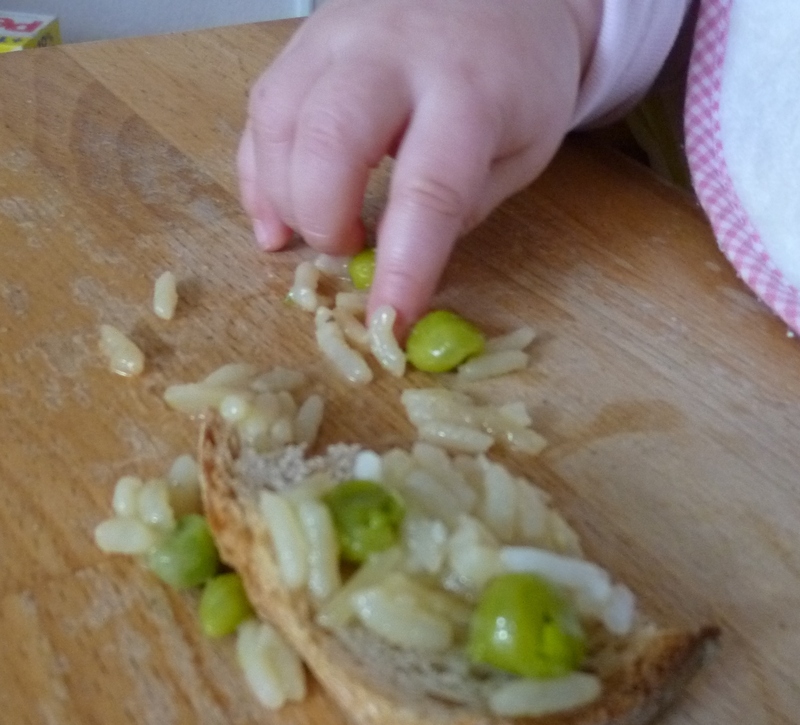 I re-read Gill Rapely’s book on baby-led-weaning, and decided that maybe I was giving Olivia her meals at the wrong times, and that she might be too tired or hungry when I sat her down to eat. I made a huge effort to sit us down to eat at that perfect sliver of time right after a nap and nursing, before she got too tired or hungry again. It did help a little bit, but she still was not all that interested in anything. Until one day when I made a beef and broccoli stir fry with green onions cut into little rings. I put a little in front of her as I had been doing every day for weeks. 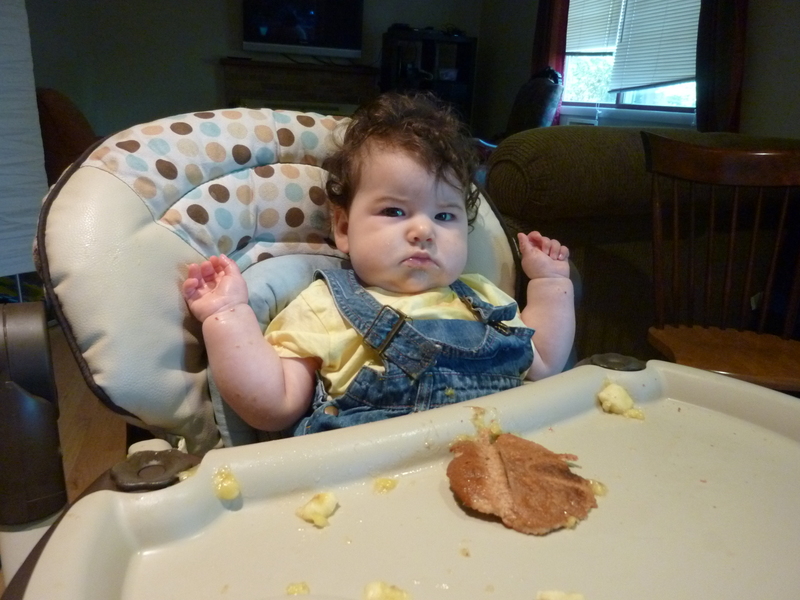 She eyeballed it and sat back in her high chair. But then, after a few minutes of staring at the food, she suddenly perked up. You could see that something had caught her eye. The interest was mounting inside that little brain. She leaned forward and extended one finger and slowly approached a green onion. She chased that green onion all around the high chair, and it fit perfectly on her little finger. Then she picked it up and put it in her mouth. I figured she would just push it back out, but she didn’t. In fact, she chewed on it with her little teeth and pushed it around with her tongue. And then she picked up another, and another! After she had eaten about five of the green onions, she looked at me and started grinning. Through those clenched teeth I could see her mouth stuffed with a bunch of green onions. It was such a hilarious sight! I don’t think she ate more than a few tiny chunks off those onions, because most of it ended up “falling” back out onto the table. It was obvious that she liked them, though, and that’s when it finally dawned on me that my “stick-shaped” foods were not what she wanted. She was starting to master her pincer grasp, and she wasn’t at all interested in large chunks anymore. So after that I started cutting things into tiny pieces for her, and suddenly her interested was piqued. All of a sudden she started trying to pick up bits of everything, the more microscopic the better. I also noticed that she prefers dark foods. And yet, she very rarely actually swallowed anything. So far my biggest successes have been green onions and spinach. Odd choices, I know. I really thought she would have liked apples, pears and bananas, but she doesn’t seem to like the textures of those because she has yet to actually get any of them into her mouth. As soon as she picks up a chunk of banana, she starts waving her hand around as if she were being attacked by a snake. And no matter how much I try to explain to her that her mouth would be a great way to get that banana off of her finger, she just doesn’t listen! Imagine that. Now that it is cold season and we have had three colds one directly after the other, I decided Olivia needed some more vitamin C. I started peeling an orange and I was going to let her try to pick up the individual juice sacs. But Olivia was so excited by the sight of me peeling the orange that she was practically leaping out of her high chair to get at it! To keep her happy I gave her a large chunk of orange peel to chew on while I finished. I figured she would taste it and immediately drop it since it’s quite bitter. But lo and behold, she *liked* it! She kept chewing on it and chewing on it, sucking off little bits here and there for more than fifteen minutes! And although I put some actual pieces of orange on her tray, she was not a bit interested in those. Imagine living in a world where babies were all the same….? Where they all followed the state-recommended schedule of foods? Ahhh but how boring would that be. If you’ve been following my previous posts regarding food, you’ll know that I have been a little unsure of how exactly to introduce solids to Olivia. 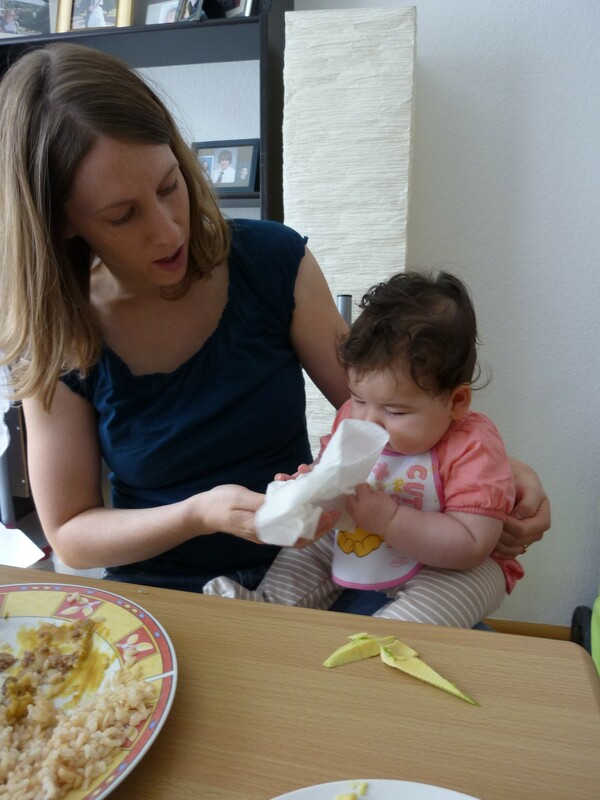 I wanted to do baby-led-weaning, but at 7 months, Olivia was still gagging on everything she put within a foot of her mouth. Even water. I’m not sure why it took her so long to loose the gagging reflex, but it really didn’t happen until she was 8 months old. And I’ll be honest, I was worried. I was starting to think I was doing everything wrong. She is NOT interested in this piece of toast with bannanas. In the mean-time, I ordered the “Baby Led Weaning Cookbook”, and when it finally arrived, I read it cover to cover. Let me tell you I was shocked to see that they hardly talked about gagging at all. Just a half page. 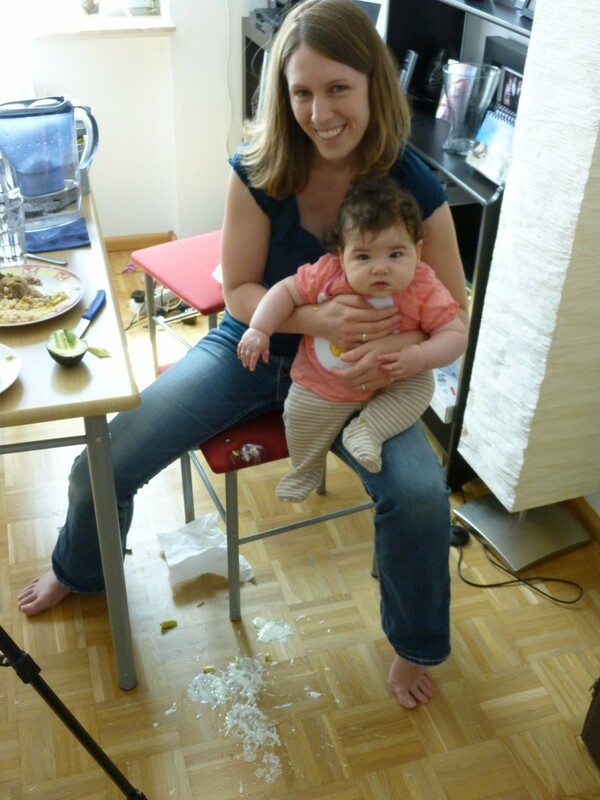 And they said that babies usually learn how to deal with the food and stop gagging after a few days or maybe weeks. They talked about 6 month old babies who were chewing on pieces of chicken, and 7 month-olds who would eat an entire apple, and then spit out the seeds! “What is wrong with my baby?” I thought. The other thing which surprised me is that most of the recipes in the book are basically just regular “food”. Things like Tomato Roasted Chicken, and Chili con Carne. Pancakes. Scrambled Eggs. Thai Green Curry. 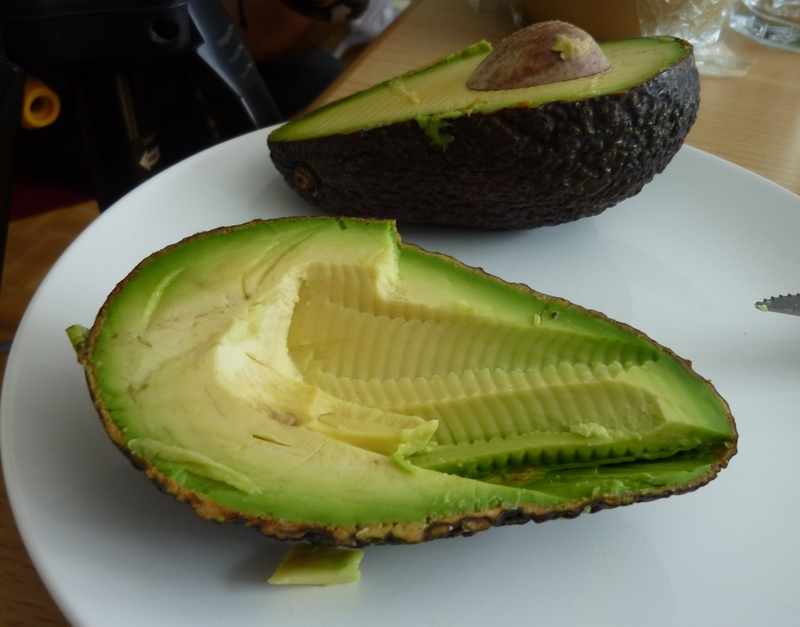 The main thing is not to add any salt or sugar, and avoid any heavily salted foods like ham. They don’t even give any kind of “recommended” age range for any of the foods. That’s when I finally understood the whole point. 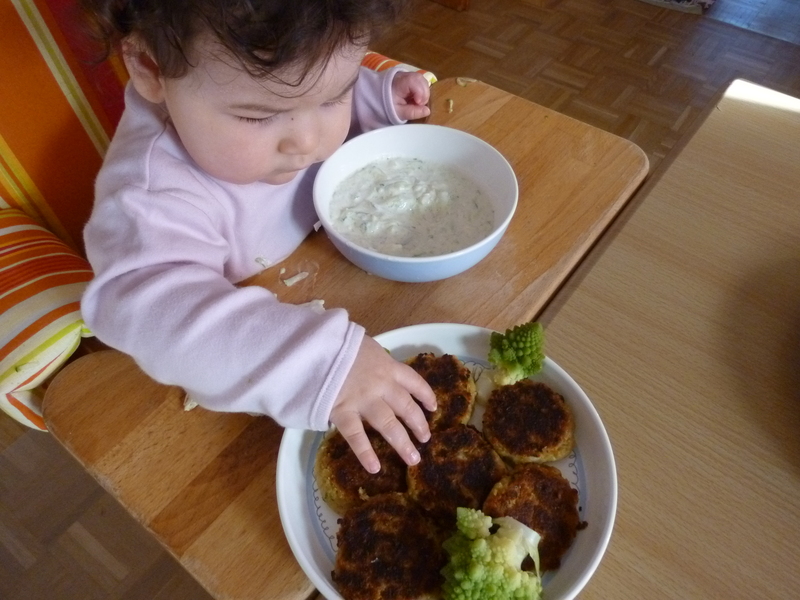 Babies really CAN eat everything from the very beginning. You really don’t have to be worried about them choking on a noodle or the banana sticking to the roof of their mouths. There are no “steps” to follow, and there are no schedules. I was so caught up in the idea of there being a “method” to follow that I was blinding myself to the simplicity of it all. So I started making meals out of the book for Oscar and I to eat, and giving Olivia a little bit on her own plate. She mostly ignored the food, or if she did touch it she threw it on the floor without even tasting it. Then I realized that she was usually too tired or too hungry at mealtimes, and so she wasn’t interested in playing with anything. I tried harder to get meals ready early, then to feed her, give her a rest, and THEN bring her to the table for lunch. That was when it finally started working. The first meal she really “ate” was a pasta with tuna fish and tomato sauce. I was really impressed that she liked it and kept bringing bits of it to her mouth! 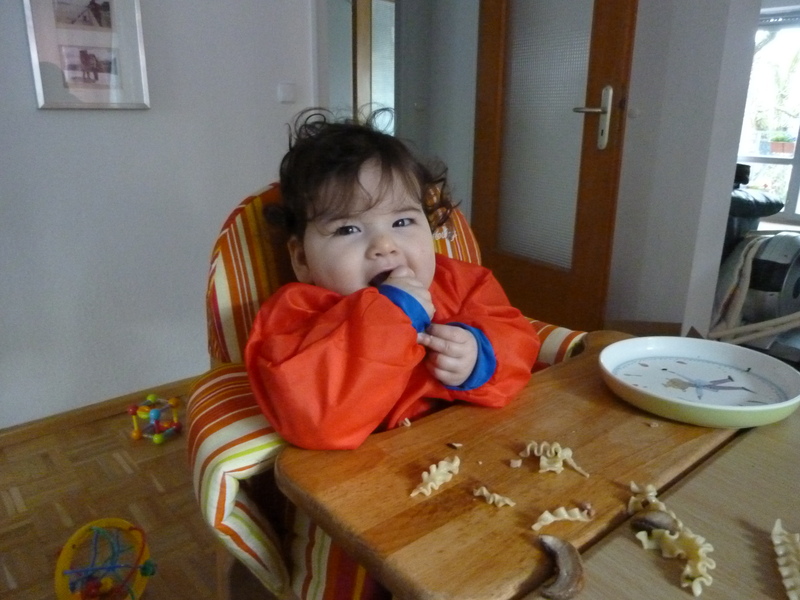 So now I include her in every meal, and she sometimes takes very small bits of it, other times she just plays with it, and sometimes she just wants down from the high chair without even looking at the food. I am letting her go at her own pace, and I am no longer worried. 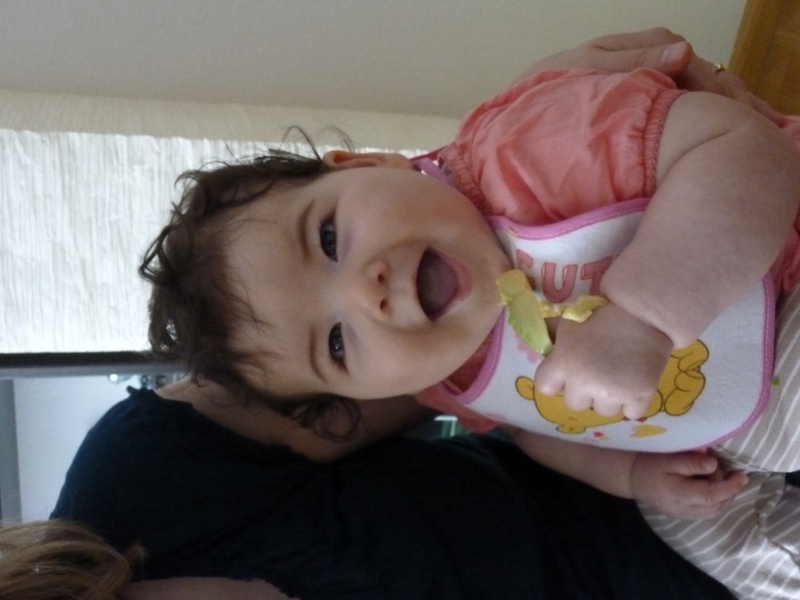 And the best part – she’s finally learned how to deal with food… she’s only gagged on food a few times in three weeks! So now I’ve pulled out all the stops. She’s had chicken, pork and beef, all in large chunks or strips. She’s also had eggs, dairy and gluten with no issues. So basically she eats with us for every meal now. She hardly swallows anything, so she really is filling her hunger with breast milk still, but that’s ok with me. I figure it will go in it’s own time. One of these days she will realize that food also can satisfy hunger, and then she will start to eat more and more. 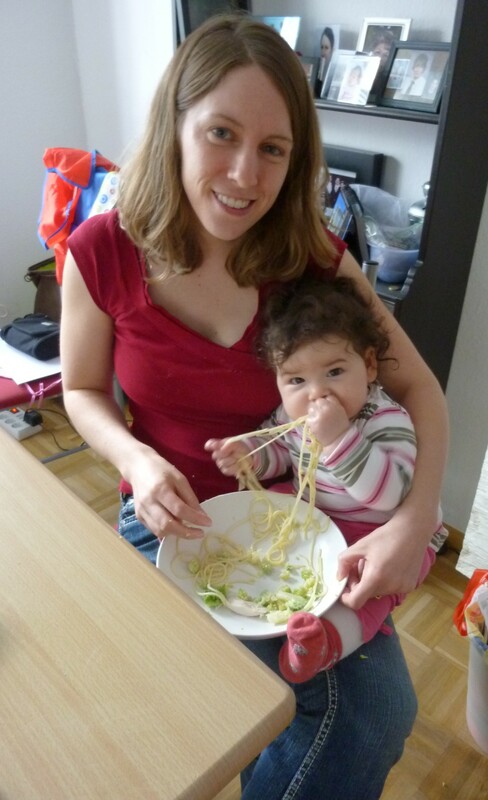 That’s why it’s called baby-led-weaning after all. 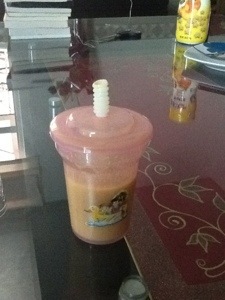 So yes, my 9-month-old is still 99% breastfed. But she is also very healthy and strong, so I am not worried.